Did you know granite makes up approximately 70-80% of the Earth’s crust?Like you, the ancient Egyptians transported it hundreds of miles for use as the original coverings for the Great Pyramids. Well, it’s true! The ancient Egyptians recognized that granite could be beautifully polished, and could resist acid attack (yes even then acidic rain existed). Today, we no longer sheath our homes with granite, but its advantages still make it the most durable choice for countertops and walls. Its hardness resists wear better than marble and other softer stones. Its acid resistance provides superior resistance to etching from drinks and food in the kitchen. It’s an ideal decorative accent in homes and businesses. Ancient wisdom persists. 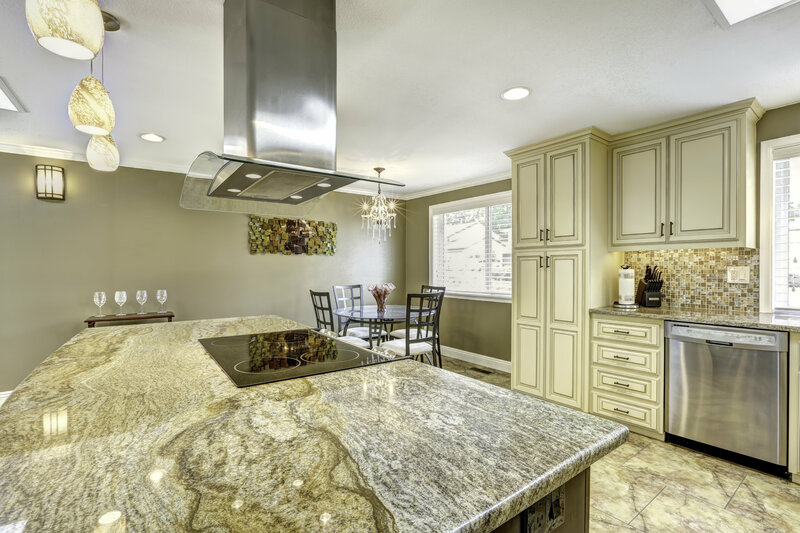 Properly protected and cared for, granite will last generations…but its not indestructible. Its achille’s heel? Staining. Arguably, the most important variable in your stone care regimen should be how it’s sealed. Granite is porous. In fact, the explosion in granite colors and options is made possible by the most recent advance in technology, that has quarries drawing a polyester resin through the stone to fill in these pores in order to improve its flexibility, reduce its brittleness, and enhance its ability to survive an extended voyage across a choppy ocean within fracturing. Unfortunately, not all granite is “resonated,” and its very difficult to determine whether an installed slab has been resonated. If it has, no further sealing is needed. If it has not, then the greatest risk to your investment is that it absorbs a stain, with the most common being kitchen oils and greases. The second greatest source are people-oils along the edges where we lean against the counter. Once stained, the dirt and oils are in the granite where they cannot simply be wiped away. This shows as a darkened or discolored area. The good news these are often be removed, however often is not a guarantee, and the amount of time and effort required is no extensive that it is often not worth it. It may require a dozen treatments, with noxiuous solvents to draw out the stain. Meanwhile you have lost use of the room while you hope it comes out. Moments of anxiety, regret and second thoughts, as you recall this could all have been avoided had you arranged to seal your counter each year. A quick inexpensive process that takes a few minutes to complete, yet saves immense anxiety and expense. The very act of using and cleaning your counter can remove this seal, as acidic foods, drinks and cleaners unzip the sealer’s chemistry slowly removing it over time. Its not enough for a cleaner to claim to be stone safe, it must be non-acidic else it is trading a momentary clean for a longterm stain risk. 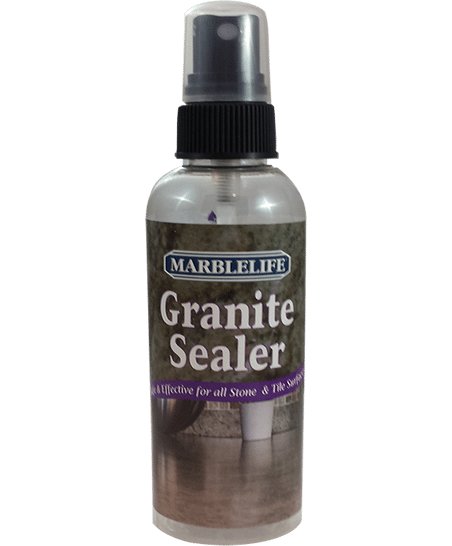 Keep your granite looking stunning with MARBLELIFE’s Stone Sealer and MARBLELIFE’s Granite & Quartz Cleaner. Our proprietary formula with its wipe-on, wipe-off application provides enhanced stain resistance for sealing marble, terrazzo, grout, and yes, granite. Our cleaner’s offer exceptional degreasing action with a streak-free cleaning that is so effective, you will find numerous uses around the house. It so powerful you would have no problem cleaning your counter, and then cleaning the greasy parts of the engine you are rebuilding in the garage. Designed to repel oil and water MARBLELIFE’s fluoropolymer impregnating sealer provides immediate protection. Penetrating the pores to seal the stone from the inside out without impacting the natural beauty and appearance that attracted you in the first place. Dirt and oils are kept above the stone, where they can be easily cleaned up and removed. Do this a few minutes prior to sealing and allow the surface to dry completely before applying seal. Using a clean dry cloth, pour MARBLELIFE sealer onto either cloth or the stone surface and apply to the entire surface. Make sure to apply enough sealer so that the entire surface takes on a “wet” sheen. Allow to soak for at 10 minutes, making sure entire surface remains “wet” during application. After soaking, use a clean dry cloth to buff the surface dry. If you notice streaks, re-wet with sealer and rub out the streaks before buffing dry again. 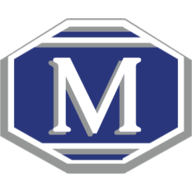 As always, if you have any questions or concerns regarding sealing your natural stone, contact your local MARBLELIFE office. Our highly trained stone craftsmen will be happy to assist you in any way they can. MARBLELIFE Stone Sealer’s wipe-on, wipe-off application provides enhanced Stain Resistance, in an easy to apply product for sealing marble, granite, terrazzo and grout.